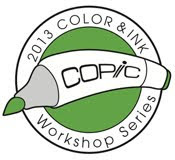 The entire scene was colored with Copic markers. The lower "rock" was colored on a separate image and popped up over this panel. I colored the mermaid's "outfit" on a separate stamped image. I then covered it with a piece of double-sided sticky sheet tape and rubbed Glitter Ritz Highlight glitter all over it. Then, I cut it out and paper-pieced it over the image on this panel. I colored the image below near the tail so I could leave her tail free and "flipping". I went over all the bubbles with Sakura clear Glaze Pen. 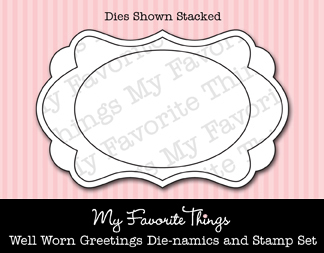 The sentiment was added with the new File Tab Die-namics die, which is PERFECT for sentiments. LOVE it. 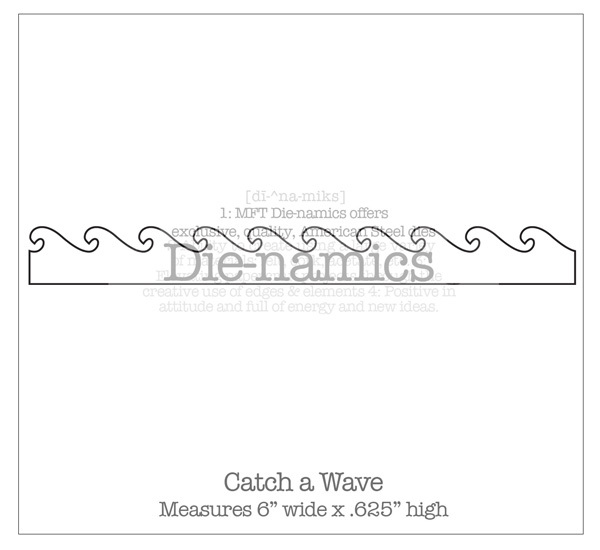 I added a layer of waves cut with the Catch a Wave Die-namics die. I love how the highlight glitter catches the light and it picks up the hint of color. SO pretty in real life, but the photograph captured some of it as well. I thought the netted ribbon was appropriate. Instead of tying a bow, I curled it with the end of my paper piercer, and to my surprise, it stayed. YAY for that. I also made a card with the new Triple Scoop stamp set, Clearly Sentimental about Sympathy, which you can earn for FREE tonight with your order. Click HERE to read all the details. 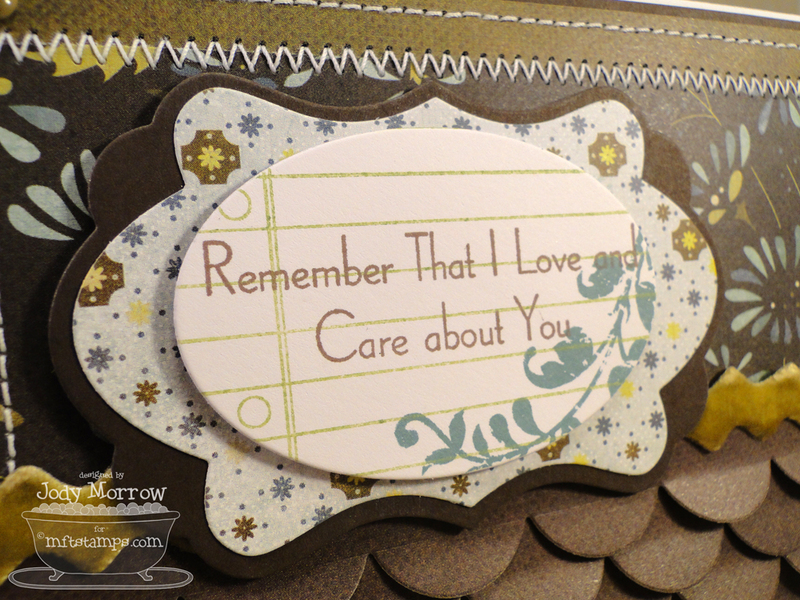 For the focal panel I used some stamps from the Own Your Story stamp set, and then stamped the sentiment from the Clearly Sentimental about Sympathy stamp set. 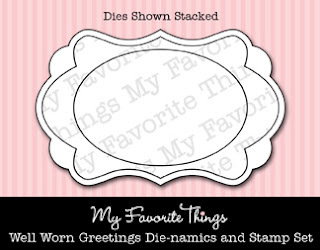 I opted for the Well Worn Greetings Die-namics die-cuts to house the sentiment and it was a perfect fit. I even finished off the inside with another sentiment from the set. The MFT release is on July 5 at 10 PM EST. You can attend the release party from 8-10 PM EST here in the forum for fun, games, and prizes! 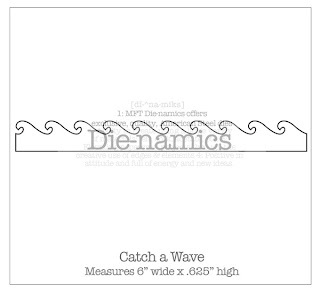 All the new sets and dies will be available July 5 at 10 PM EST. 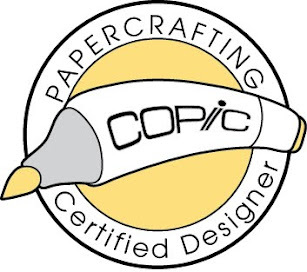 Be sure to check in on the guest designer contest to see who is crowned the winner. The announcement is made in the release party thread, AND on the guest designer contest thread in the MFT forum on SCS. 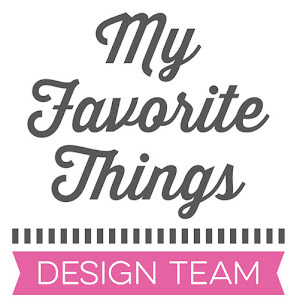 The winner will receive over $100 in stamp sets and play along with the design team next month. If you'd like to see all the teasers for today, please click on over to Kim's blog NOW! Be sure to leave comments as you go for a chance to win one of 2 $10 vouchers being given away daily, just for leaving a comment. :) The final 2 winners will be announced at the release party, and will also be contacted by e-mail. Beautiful cards! Love the glitter on the mermaid! Purple is my favorite colour!! :) Thanks for sharing! Both cards are beautiful in their own way. 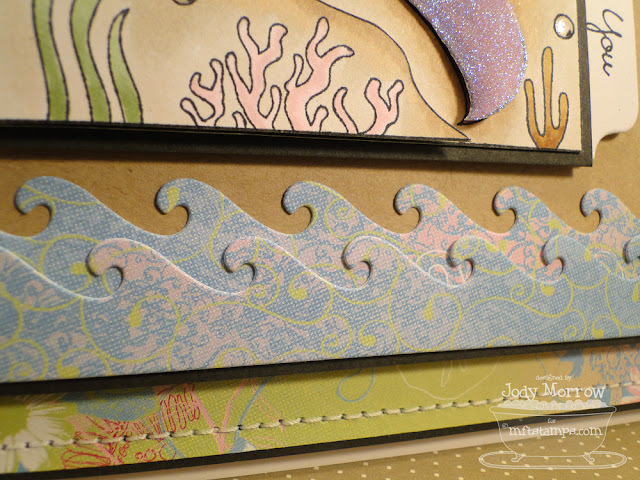 Love the layers on the mermaid card - a fun and beautiful scene. And the sympathy card is beautiful and classic - the rows of scallops are very striking. Beautiful cards! 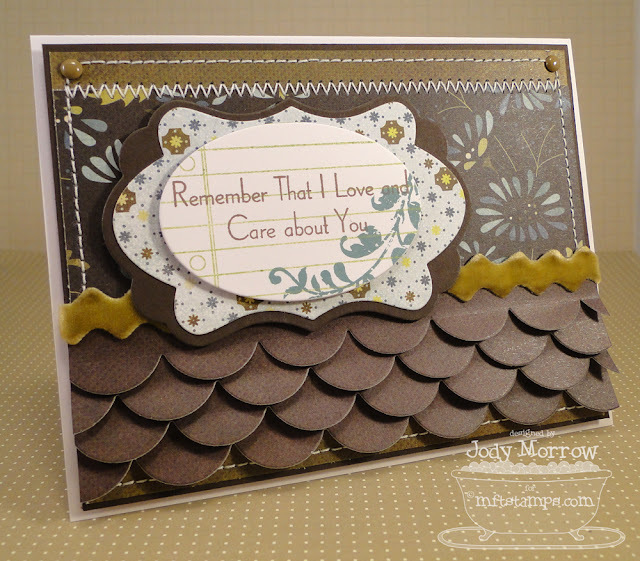 I can see why you enjoyed making your Mermaid card...all the details make it special. having fun is what it's all about - you go girl! Gorgeous!!! Gorgeous!!! Love this card!! Beautiful colouring and the glitter on the mermaid is Awesome! Love it! Beautiful cards! Love their rich colors! Oh I love your Mermaid card too, it's fabulous, go ahead and say more.....love the glitter and how it enhances the colors and the scene you made is so great!!!! love the other card too, but the Mermaid card is it. Jody...you deserve every bragging right about this card. Simply amazing. BOTH card are in fact. Love every little, tiny detail of the mermaid card! I'm glad you were gushing over your card. It is worth it. Love all the layers, her sparkles are so pretty. Are you sparkly,too? And the ribbon was P E R F E C T! Oh, and the second card is beautiful! 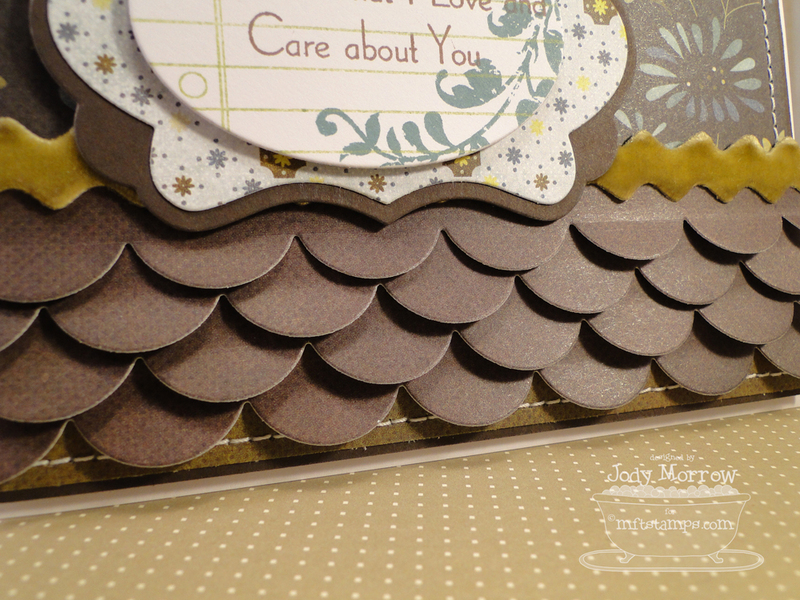 Love the scalloped rows! Jody, both are fabulous! Love all that glitter on the first one! MUST get some of that stuff! Fabulous dimension! Your sympathy card is beautiful with all those scallops! Jody!! 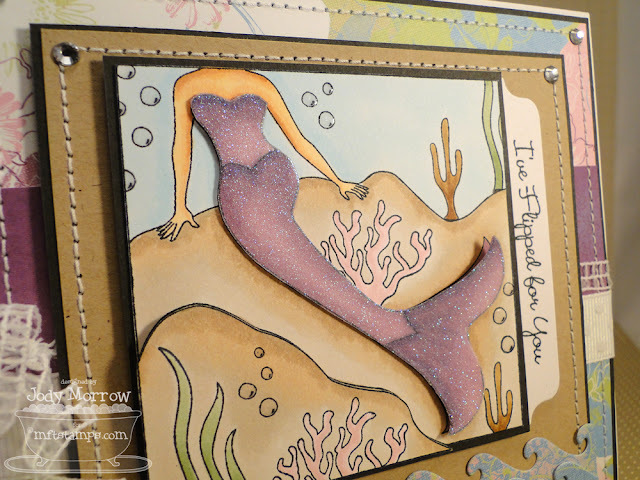 You can totally tell that you had THE best time with you mermaid card! It's GORGEOUS! I also love the sentiment on the second card as well as the delicious scalloping! So beautiful! I can see why you had a blast creating! I love them both! Beautiful! LOVE the scene you created! 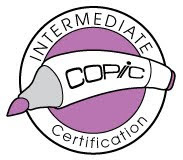 Hey, every once in a while, you HAVE to brag a little! This card is totally bragworthy! WOW!! What a beautiful card. I love all the details. Thanks for sharing. Jody - the glitter on the mermaid is awesome!! Your second card is wonderful to let someone know you care! You deserve to gush. Your cards are fab! Your mermaid card is so lovely!! The colors are so soothing! WOW WOW WOW WOW! Gush all you want Jody! Your mermaid card is GUSH-worthy! LOVE all the texture and dimension! I could stare for hours! Your CS card is a STUNNER as well! LOVE the papers and all those scallops!!! ELEGANT!!! The mermaid is so 3D and creative! What fun! Wow! 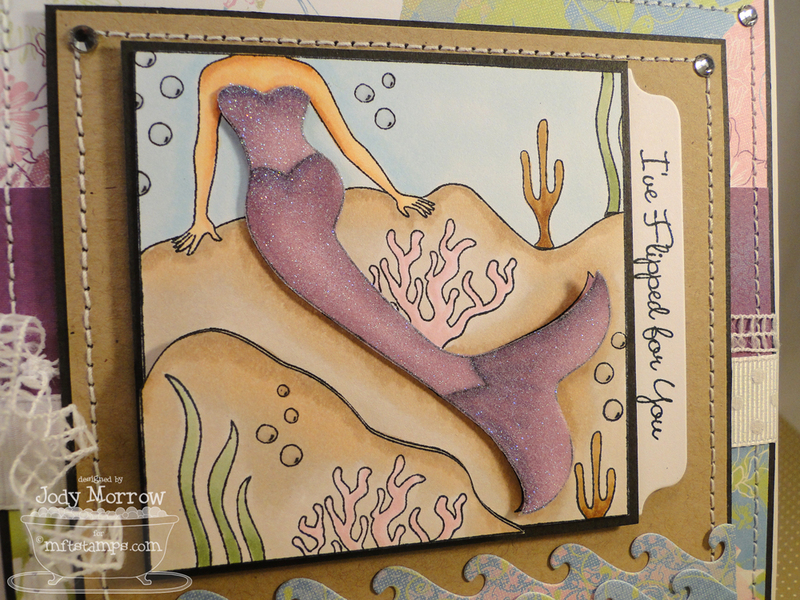 Your mermaid card is absolutely amazing! Her "dress" is simply stunning! it really makes the card POP. another beauty! that mermaid is fun to dress up and build a scene! 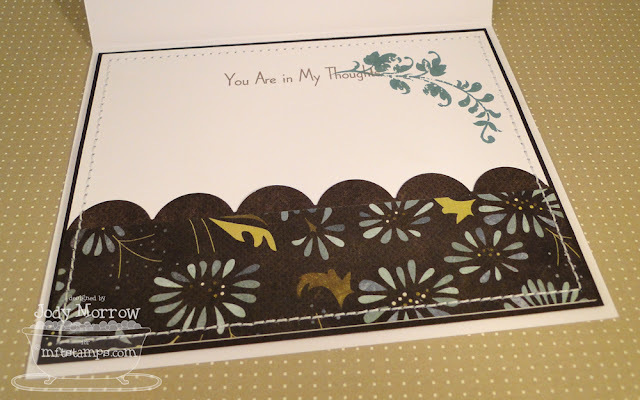 gorgeous sympathy card, too!